As always we have a ton of marvellous questions this week and this is a huge one! A lot of people who are up-and-coming use the word stems, and they use it as a euphemism for tracks, however, stems are technically when you bounce tracks together. So when someone says to me “I really want to get some stems from you for a live show” what they are saying is they want to take all of the keyboard parts which could be panned all over the place, some strings and a synth part bouncing backward of forwards, and they want it so be stemmed out. In other words created as a pair of stereo tracks, which they could then trigger to have them play along with the click at the show. The same could be done with stereo guitars, that is a stem of the guitars. – This is what for years and years has been referred to as stems. Now I have noticed and I see it in questions all the time, people ask about stems when they mean individual tracks. Be really, really careful because somebody once asked me to get the stems and I literally stemmed the whole album. I took the album and we did stereo drums, stereo guitars, keys, backgrounds, you name it. We made all of these tracks so they could open them up in a live situation and have maybe 8 stereo files, 8 stereo “stems” to work with. So we sent it and we get a phone call a week later and it says “we opened up the tracks on the computer and they’re not individual stems.” – The phrase in itself was a contradiction. The proper statement would have been “we opened up the tracks and there weren’t any tracks, there were only stems.” I know what tends to happen, we take a word like that and it becomes a euphemism and it might mean individual tracks to some people. However, a lot of people who have been recording for a while will not understand when you say “please send me the stems” they may well send you 8 stereo files all bounced together. 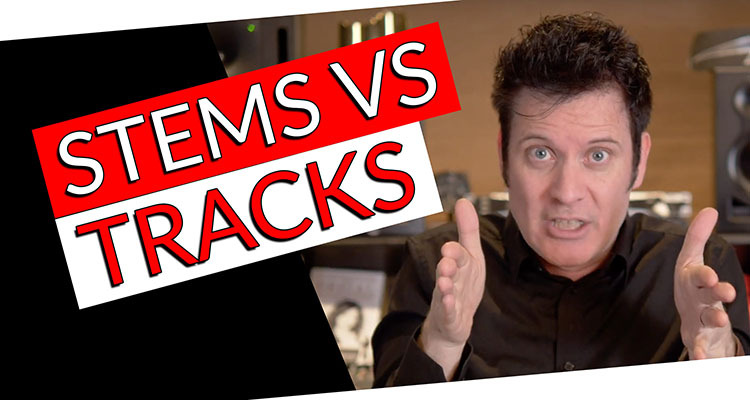 It’s worth understanding the difference, even if you’re communicating with somebody that understands that you mean tracks when you say stems. Another dance music guy or girl that you’re working with might say “send me the stems”, they probably do mean the stereo keyboard and the stereo something else, but they don’t mean bounced together. Make sure you understand the difference because if you don’t and somebody is really specific about stems and they want combined tracks then you might send them individual tracks, then the opposite when they want individual tracks you might send them combined tracks. Traditionally tracks are tracks, they are independent, individual elements. Stems are bounced together, incorporated stereo files of various, different instrument groups. – Hopefully that all makes sense.